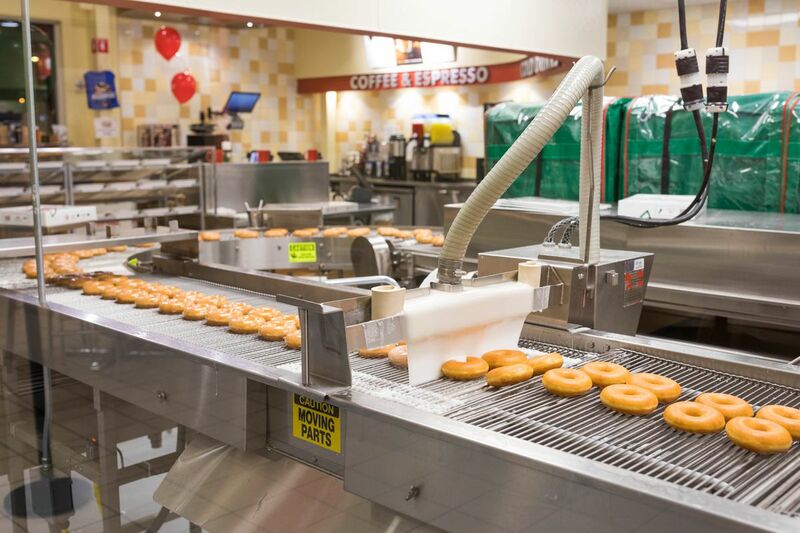 Are fresh Krispy Kreme doughnuts worth Alaska's wait? People camped out overnight before Anchorage's first Krispy Kreme opened in August. Sleeping on the sidewalk in order to be among the first customers? Sure, the first 100 would get free doughnuts for a year, but still: How can a fried pastry inspire such fanaticism? You'd know the answer if you'd ever eaten a fresh-from-the-fryer glazed doughnut. In an article in The New Yorker, Roy Blount said that Krispy Kreme sinkers "are to other doughnuts what angels are to people." Hyperbolic, but not by much. A warm Krispy Kreme glazed doughnut is a feather-light confection bathed in a glaze as sweet as the memory of first love. While the shop sells doughnuts of all stripes, from frosted to fritters, it's the sugar-shellacked version that causes an aficionado's eyes to, well, glaze over. Even if you're not a glazed doughnut fan you should try one — but only if it's still warm. 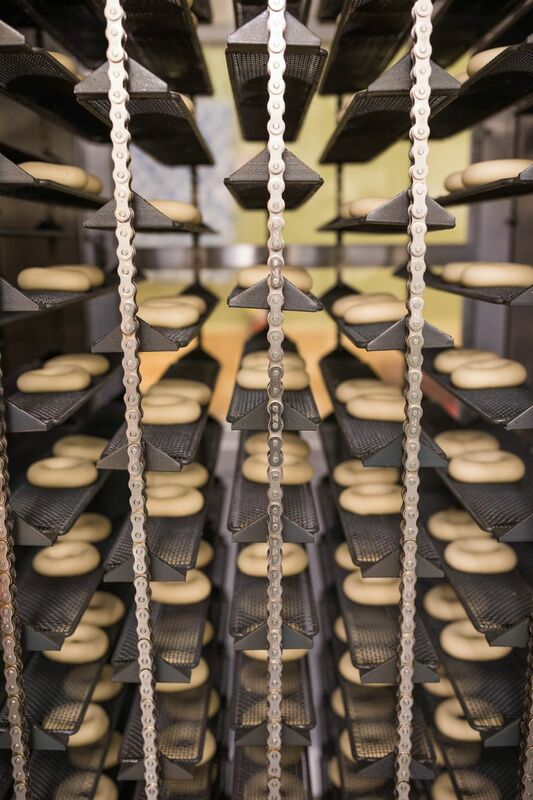 Just as fresh bread has a texture that solidifies within an hour of baking, so does a Krispy Kreme change from the lightness of cotton candy to the predictable heft of an everyday doughnut. Allow them to cool and they're pretty much like glazed rings or maple bars from anyplace else. But a still-hot glazed doughnut from Krispy Kreme probably won't cool down. It vanishes in just a few bites, leaving you wanting moremoremore. I sampled bites from several varieties — frosted, sugared, old-fashioned — but kept coming back to the glazed sinker like a Skinner rat in search of reward. That melt-in-the-mouth lightness defies description. I brought a teenage nephew with me to Krispy Kreme. After inhaling five doughnuts, which ranged in price from $1.35 to $1.55, he pronounced them all quite tasty. Yet later I heard him tell a friend that he "didn't see what all the fuss was about." Doughnuts are doughnuts, he said. He's not the only one who feels this way. A glance at the local shop's Yelp page shows a few comments like "they weren't anything special at all" and "not living up to all the hype." Maybe they'd cooled before the diners ate them. Or maybe the dissenters never experienced Krispy Kreme in their youths: Nostalgia is a big part of the shop's appeal. The chain is known for its "factory" design, i.e., visitors see the product being made. 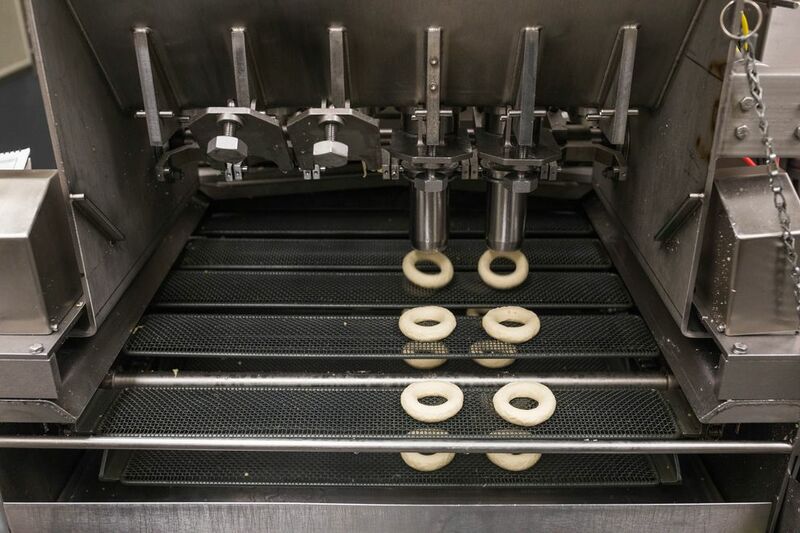 Longtime fans remember watching rings of batter dropping into boiling oil, sliding off onto conveyor belts, rolling through waterfalls of glaze, then slowly, slowly moving toward salesclerks who waited to deliver the steaming sinkers to hungry customers. These folks are buying the sizzle as well as the sugar. Put another way: I grew up in South Jersey and have fond memories of Tastykakes, a regional snack cake brand. As an adult, I know that Krimpets and Kandy Kakes aren't really as good as I once thought. Yet I crave them because of the association with my childhood, and relish them when I visit family. 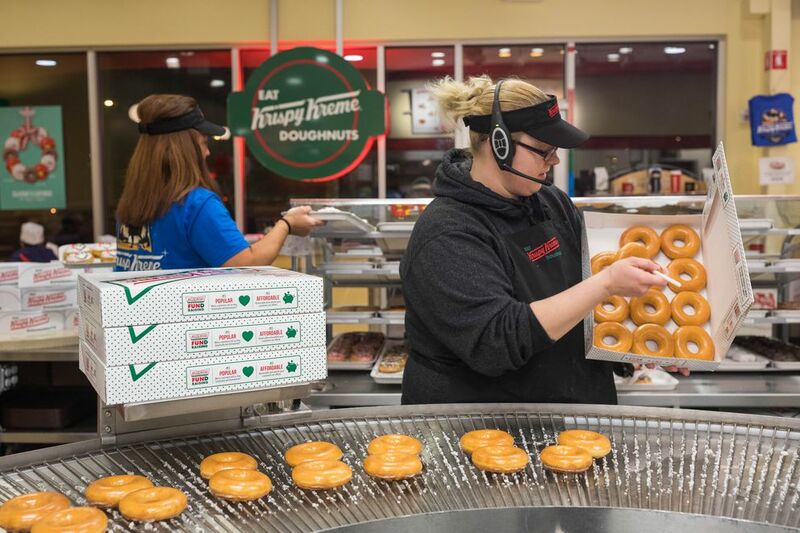 Krispy Kreme newbies will likely enjoy taking their own children to the shop. The novelty of watching doughnuts being made will be fun for the kiddies — and, truth be told, for the adults. There's been backlash against the chain in some quarters, according to the book "Donuts: An American Passion." Too slick. Too corporate. If you're the kind of person to avoid chain restaurants on principle you could always go to the Kobuk Coffee Co., which makes small batches of superb sinkers — including a delicately sweet birch syrup variety that was included in "The Best Dozen Doughnuts in America" by travel writers Larissa and Michael Milne. Or head someplace like Golden Donuts, Dino's Donuts or even the bakery departments at Carrs or Fred Meyer, all of which turn out reliable pastries. Heck, I've had decent luck at the Holiday convenience store, which produces fresh doughnuts daily. In Seattle I lived a little more than a mile from a Krispy Kreme store but stayed away for health reasons: A single glazed packs 190 calories, 100 of which are from fat. I visited the Seattle shop only three times in eight years. Now that the chain operates in Anchorage I'll be similarly cautious. They really are that easy to eat, and even easier to regret having eaten — especially since it's hard to stop at just one. Yet I expect that some evening I'll drive by just as the "hot doughnuts now" light flashes on, and will savor the chance to get a doughnut so fresh my fingertips sink into its warm, pillowy surface. Moderation in all things, especially Krispy Kreme. But if you do indulge, plan to buy at least two — and to enjoy every fast-melting bite. Donna Freedman, a former Anchorage Daily News reporter and reviewer, blogs at DonnaFreedman.com.